This article was last updated on July 31, 2017, when a public map of all geolocated SVBIED attacks in and around Mosul was published by Twitter user @obretix. Mosul was captured by so-called Islamic State (IS) militants in June 2014. More than two years later, on October 16, 2016, Iraqi Prime Minister Haider al-Abadi declared the start of the operation to recapture the Iraqi city, dubbed Operation We Are Coming, Nineveh. The offensive progresses slowly despite he massive advantage in manpower, equipment, and the backing of several air forces. The use of human shields has been mentioned as a cause for the slow-moving offensive, and bomb-ridden suicide cars have been another. Hundreds of these so-called suicide vehicle borne improvised explosive devices (SVBIEDs) have been sent towards anti-IS troops and vehicles in the first seven weeks of the offensive, according to a senior Iraqi official. This overview aims to archive, geolocate, and map all the footage of these attacks and will be updated when new information is available. The list is chronologically structured, and only lists incidents taking place in or in the immediate vicinity of Mosul. Many of the VBIED attacks have been filmed by an IS drone, with a pulsating green circle under the VBIED and red squares under indicating their military targets. The colours represent the week in which the attack took place (see colour scheme below; black means no date could be established for the day of the attack). Note: Google’s satellite imagery for Iraq dates back to 2004. Microsoft Bing’s more recent satellite imagery has been used for geolocation. All incidents mapped are presented and, in some cases, discussed below. Most of the geolocations were tweeted by Twitter user @miminas999. A’maq News Agency, IS’ most important auxiliary media wing, claimed in two separate reports that nine suicide attacks were conducted against Peshmerga troops near Mosul. Charlie Winter, a senior research fellow at the International Centre for the Study of Radicalisation, is following IS’s strategic communication response to Mosul (see his thread on Twitter) and said he expected an “acceleration in defensive suicide (not just terrorist)” in the upcoming weeks – and extensively used for this overview. On the same day, IS claimed three more suicide attacks. In words of Mr. Winter, “suiciders are the equivalent of guided munitions – they will feature heavily in this battle.” And they do indeed. IS reported five suicide operations, including one against the Popular Mobilisation Units (PMU), an Iraqi state-sponsored umbrella group of around 40 (pre-dominantly) Shia militias. IS reported three suicide operations, respectively against the Iraqi Security Forces (ISF) south of Mosul, and southeast of Mosul against the PMU. A photo of a suicide bomber was published by IS’s Nineveh Province media wing. Eighteen suicide operations were reported by IS media, including four against the PMU east of Mosul, four against the ISF southeast of Mosul, and three against the Peshmerga northwest and east of the city. Five suicide operations were reported by IS. Five suicide operations were reported by IS; seven by A’maq. All named bombers were Iraqi, Mr Winter tweets, noting that IS is releasing pictures and names of the suicide bombers “on an unusually irregular basis”, making him wonder whether there are too many to keep track of. IS reported three suicide operations, two of which southeast of Mosul. Besides, IS reported its first inghimasi operation during its Mosul defence, and later the day another two. “The concept of inghimasi refers to a special-forces style suicide fighter who carries both small arms and explosives. He initially uses his light weapons while wearing an explosive belt that is activated only when he runs out of ammunition or when he feels threatened or trapped. The Inghimasiun essentially act as ‘shock troops’, aiming to soften the defences of their military or civilian targets”, Cameron Colquhoun wrote in an Bellingcat post. A photo of an unnamed suicider driving away in the SVBIED was also posted by IS’s provincial media (tweet). A day later, on October 25, IS published two photos of this day’s inghimas suicide bombers: both Iraqi, and one appearing to be a child. Three suicide operations were reported by IS media. An IS video release features footage from six suicide bombers, who were according to Mr Winter previously anonymous. The video includes two child suicide bombers. All individuals were said to be Iraqi. Two suicide operations reported by IS. Ten suicide operations were reported by IS, including five against ISF and PMU positions south of the city, one north (but on October 30, 2016). A’maq also reported ten suicide operations (the same as mentioned by IS, most probably). IS reported four suicide operations south of Mosul, two of which were with explosive-ridden Humvees. Another suicide operation was reported later, targeting the PMU. Two other suicide operations were reported later that day, one against “SWAT forces on the outskirts of Gogjali, east of Mosul” and another one targeting Peshmerga west of Bashiqa. A photo of one of the Humvee SVBIED was also published, cleary showing the one suicider operating the turret on top, and the other driving, as Mr Winter points out. IS reported eight suicide operations, including one targeting anti-IS forces in Gogjali, two southwest, and one southeast of Mosul. IS reported three suicide operations in Gogjali, east of Mosul. A’maq reported the 100th suicide operation during IS’s defence of Mosul. IS reported two suicide operations. Besides, at least four photos of a SVBIED attack were published by IS media. The explosion has been geolocated to the Arpachay neighbourhood (Wikimapia), in northwest Mosul. IS reported two suicide operations, including a photo from a suicide bomber allegedly from the United Arab Emirates. A photo report of a SVBIED attack was also published, and geolocated by @miminas999. The annotated photos and Microsoft Bing satellite imagery were tweeted by @miminas999. IS reported suicide operations, two in the Intisar and al-Samah districts respectively. A’maq also reproted a suicide operation in Intisar. A’maq also published an infographic on suicide operation figures: 105 operations (three of which were with two suiciders) in the first three weeks of IS’s defence of Mosul. A’maq reported a suicide operation north of Mosul. IS reported a thanā’ī suicide operation, meaning two suiciders were involved. Their nationalities were allegedly Uzbek and Tajik. IS reported a suicide operation of the night before, southwest of Mosul. A Tajik suicide bomber also targeted anti-IS forces in the as-Samah district of Mosul, according to IS. IS reported two suicide operations in as-Samah, by a Saudi and an Iraqi from Mosul respectively, and one in Intisar. IS reported one suicide operation. Three suicide operations reported by IS. IS reported a suicide operation, A’maq did too. A 26-minute video, named “The Promise of Allah”, shows eleven suicide operations, some of which have been geolocated. IS reported a suicide operation by an Egyptian. Two suicide operations reported, one in the Zahra district. IS and A’maq reported three suicide operations. The emir of IS’s War Committe, interviewed by IS’s An-Naba newspaper, says that “We are pleased to say there is a very large number of suiciders, and the number of new volunteers is only increasing” (via Mr Winter). IS reported an inghimasi attack (though not close to Mosul but south of Tal Afar), as well as three suicide operations, including one in eastern Mosul and one southwest. One suicide operation reported by IS. Two suicide operations reported, one by IS and one by A’maq. Two suicide operations claimed by IS, one in the Intisar district. Seven suicide operations reported by IS respectively by four from Iraq, two from Syria, and one from Morocco. A’maq published another infographic on suicide operations, 20 in total for the fifth week of the operation, making it 151 in total in 38, as Mr Winter notes. Four suicide operations reported by IS, and also an inghimas operation reported in the Tahrir district. IS reported a twin suicide attack on the outskirts of Muharibin (Wikimapia), conducted by two individuals from Dagestan. Four suicide operations reported by IS. Four suicide operations reported by IS, three of which took place on November 27, as well as one inghimas operation. The operations were conducted by two Iraqis and one Saudi. A’maq also published a new infographic regarding suicide operations: 171 in 42 days. Ten suicide operations reported by IS, including ones conducted by two Chechens, four Syrians, and one Moroccan respectively. Three suicide operations reported by IS, two bombers from Iraq and a third from Syria. Five suicide operations reported by IS, two Iraqis, one Kurd, one Russian, and one Kyrgyz. Three suicide operations reported by IS, including a child from Morocco, Abu Mujahid al-Maghrebi (Arabic: أبو مجاهد المغربي). His suicide operation was filmed by a drone, and published by IS’s provincial media wing on January 3, 2017. His suicide operation can be geolocated to the Tamim neighbourhood (Wikimapia). In the same video, a second VBIED targets an ISF convoy just a hundred meters away of convoy targeted by the Moroccan teen (Wikimapia). The VBIED operation was carried out by Abu Hamza al-Iraqi. As smoke is still rising from the location where the first VBIED exploded, it is very likely to assume this second VBIED attack took place on the same date. Photos showing the devastation as a result of the VBIED were also published by IS media. A’maq infographic claims there were 196 suicide operations in and around Mosul in the first 49 days. IS claimed twelve suicide operations, conducted by individuals (including children) from Russia, Iraq, Morocco, and Syria. Furthermore, IS attacked the ISF, based in the al-Salam hospital. The seventh VBIED shown in the January 3 video, was geolocated to the Al-Salam Hospital (Wikimapia). The attack was conducted by Hamza al-Moslawi. An earlier video called ‘Armor Hunters’ also showed a VBIED attack meters away, at daytime. The hospital was set up as an ISF base, but were forced to pull back after a fierce battle with IS on December 7, 2016. The VBIED attacks thus likely took place on or around that date. Six suicide operations reported by A’maq. IS media published photos from suiciders, including two from Iraq, two from Syria, one from France, and one from Egypt. Six suicide operations reported by IS, three conducted by Iraqis, one by a Syrian, and one by a Tajik. A video of a suicide operation in the Tamim neighbourhood was published, and three other suicide operations were reported. One suicide operation, by an Moroccan, reported by IS. Two suicide operations, one by a Tunisian, reported by IS. Four suicide operations reported by IS, three by Iraqis and one by a Syrian child. One suicide operation reported by IS, perpetrated by an Iraqi. Four suicide operations reported by IS (including one thana’i): two Iraqi, one Tunisian, one child. Four suicide operations reported by IS, perpetrated by a Syrian and a Russian (“Abu Ibrahim al-Daghistani”). One suicide operation reported, perpetrator from Chechnya. Four suicide operations reported, including one perpetrator from Tajikistan. Eulogies of two suicide bombers: one from Pakistan and one from South East Asia. One suicide operation reported, by an Iraq in Intisar. One suicide operation reported, attacked was a Syrian child. IS’s media-wing for its Nineveh province published a new 41-minute long video “The Procession of Light”, including no less than eighteen VBIED attacks – slickly visualised as if it is a video game – in eastern Mosul which are all individually commemorated. All these targeted locations have been geolocated, the largest share by Twitter user @miminas999. The first two VBIED attacks took place in the Tamim neighbourhood on December 5, 2016, and have been discussed above. The third VBIED attack filmed by a drone took place in the Intisar neighbourhood (geolocation on Wikimapia), targeting three military vehicles and a tank. No name of the perpetrator is given. 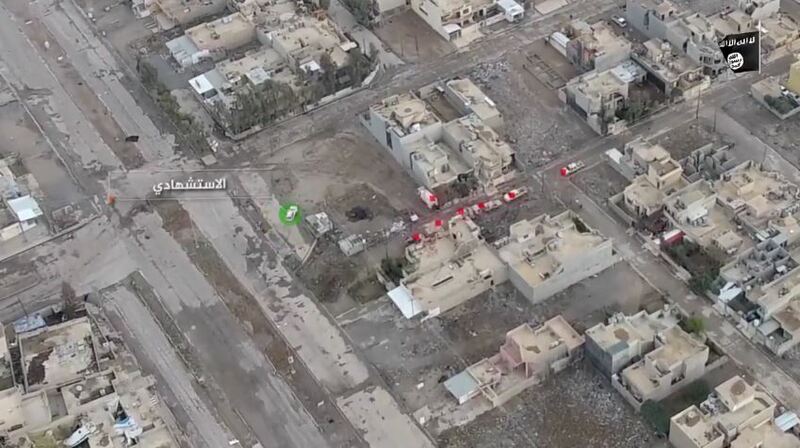 The fourth VBIED filmed by a drone, geolocated to al-Masarif district (Wikimapia). The operation was carried out by Abu Khatab al-Rawi (Arabic: أبو خطاب الراوي). The fifth VBIED was geolocated to the Zuhour district (Wikimapia), and was carried out by Abu Haroun al-Shami (Arabic: أبو هارون الشامي). The sixth VBIED was geolocated to the Bakr neighbourhood (Wikimapia). No name from the perpetrator was given. The seventh VBIED was geolocated to the al-Salam hospital, and was likely conducted on December 7, 2016, and is discussed under that date. The eight VBIED attack has been geolocated to New al-Mafti (Wikimapia). The ninth VBIED attack has been geolocated to the Akha neighbourhood (Wikimapia). The attack was conducted by a physically disabled IS militant, Abu Laith al-Iraqi. The tenth VBIED attack has been geolocated to the Shima neighbourhood (Wikimapia). The eleventh VBIED attack has been geolocated to the al-Tamim neighbourhood (Wikimapia). The perpetrator appears to have been a young (teenage) man. The twelfth VBIED attack has been geolocated to the Domiz neighbourhood (Wikimapia). The thirteen VBIED attack has been geolocated to the Gogjali neighbourhood (Wikimapia). Interestingly, the attack initially involved two VBIEDs, but the two vehicles separated their ways and only one explosion is shown, targeting twelve military vehicles. The fourteenth VBIED attack, perpetrated by “Abu Asmaa’ al-Masladoui”, was also geolocated to Gogjali (Wikimapia) and may have been the vehicle already shown in the previous attack. The fifteenth attack, perpetrated by “Badal al-Dagestani” (بلدل الخاغستاني) has been geolocated to the al-Nour neighbourhood (Wikimapia). It appears that holes in the road due to airstrikes and roads blocked by cars make it harder for the VBIEDs to reach their target. The sixteenth VBIED attack, perpetrated by “Said al-Dagestani”, has also been geolocated to the al-Nour neighbourhood, a building claimed to be a military headquarters (Wikimapia). The seventeenth VBIED attack has been geolocated to the al-Shamaa’ neighbourhood (Wikimapia), and was nearly destroyed by an anti-tank guided missile fired at from the Kirkuk-Mosul road. The eighteenth VBIED attack, perpetrated by “Abu Omar al-Russi”, has been geolocated to the Akha neighbourhood (Wikimapia). Six suicide operations reported, and three (appearing to be) teenagers were euologised by IS, two of which were suicide bombers. IS claims it conducted a VBIED in al-Furqan area (tweet, archived). A map showing all geolocated SVBIED attacks in and around Mosul as of July 2017 has been published by Twitter-user @obretix. we are dealing with people who have no respect for human life. If the Iraqi army used the same approach then carpet bombing would be the solution, but when you have concern for civilians it puts you at a severe disadvantage. Human bombs – how do you defend against people who are willing to die to kill. It is impossible. But the offensive must continue no matter how long it takes. ISIis a unique adversary, they hold no concern for any life whatsoever. They are cockroaches who only come out when the lights are off. I’ve read there are at least 1 million civilians being held captive with no hope of escape from ISIL. The ISIL fighters are willing to die and go straight to paradise, that mentality and belief has no way of being stopped. This is a mess, but it is the last stronghold of ISIL in Irag. They are running into Syria for refuse and reorganisation thanks to Assad and Putin. Thank you for your work – I doubt an institution with several grad students would have produced this level of open int. Your effort is appreciated. Comparing Mosul and Aleppo… The methods Iraqis and ‘US led’ coalition use in Mosul are no less barbaric than Syrians and Russia did in Aleppo. There are no humanitarian corridors and temp cease fire as it was in Aleppo. No fewer civilians die including doctors and kids. Nevetherless we don’t hear any critics, no Mosul’s girl Bana reports in twitter, no Britain supported White Helmets telling about barbaric bombing and shelling, no Samantha Powers in US pouring crocodiles tears on the kids of Mosul (as well as Donbas btw). Media machine lives it’s own life. Just a hypocrisy and double standards. That is not about this particular article. Sorry stranger, but your critique just holds no water. Far different story here, but you willingly ignore the differences. Why would we see White Hats operating in IS controlled Mosul? Where do we have the government dropping barrel bombs on civilian populations. Why would there be civilian corridors when IS resolutely targets any civilians try to escape that madness. You can see from these photos that the Iraqi’s are not just blowing everything up in their way as the Russkies and Syrians did in Aleppo. I think your reasoning here is a bit suspect and of course, has nothing to do with the subject of this thread. Well, you are right that the situation is different. But I mean that in anyway liberating a city takes many civilian victims. I mean different coverage of those situation in mass media serving solely dirty politics. Particularly I’m concerned they turn all media facts against Russia, even though Russia did nothing US and allies didn’t do, and Russia has always called for collaboration. Nusra also prevented civilians from leaving Aleppo afair. Whoever liberating a city, they are not fighting with an army in an open field with tanks, vehicles, airplains where the vehicles are so funny targeted by super technological missiles, with so beautiful traces and so funny fall and explode. In the city every building turns into a fortification, the fighters are spread at the large area and mixed up with civilians. No super modern US precise weapon can do anything – they cannot target a missile to each ISIS thug. Whoever is taking a city inevitably causes a lot of civilian victims, the same kids and eldery as in Aleppo, Donbas, Grozny, Czkhinval (if you remember). Sorry, but your logic suffers here as the two campaigns are run entirely differently. Still, you won’t accept that so there is little hope for changing hyoru view that the Thugs of Assad are not really doing anything different from the forces trying to retake Mosul. YOu could show us evidence of mass air attacks on the city though, that would be a start and maybe some barrel bombs dropped on who knows what. There is no any news nor any reportages from Mosul and Raqqa. That is exactly the problem. To take/liberate a city Iraqis should use air support otherwise their loses would be 3:1 The aviation used in a city inevitably causes civilian casualties. The regular bombs are ineffective against defenders spread at a larger area hiding in the buildings. So US may be tempted to use the same cluster bombs if not thermobaristic (which spread gas over a volume and then detonate), which US has plenty of and doesn’t prohibit using. A ‘barrel bomb’ is an amateur toy compared to such anti-infantry professional weapon. That is just a common sense. Why do you thing taking Mosul and Raqqa is safer for civilians, than Aleppo if there is no any information from there? Some leaks happen like a funeral bombed by US ally – Saudi in Yemen. But overall, mass media spin off Aleppo and try to ignore and forget or at least give less media attention for the crimes from own side. Why? I’m saying how differently Mosul and Aleppo are covered in the news and researches and that that is related to politics. The article is very good compared to many other articles here, I don’t have anything to add on it. Why am I expected to comment only on ISIS suicide bombers in Mosul and cannot touch the bigger context? If you’d like you are welcome to comment on the article as well as any others are. I see no comments. I don’t expect you to limit what you can say. To be honest the present situation in Mosul is worst because the Iraki troops are not in the position to free the way for the refugees to Turkey or Iran. The Hezbollah was / is the best Alliance for the Syrian civilians and Army. The Russia Army will leave Syria and for America it will be too dangerous to free the citizens even with Turkey backing up. Hope that some are in the possibility to break through the barricade to enter Turkey on their own effort. Dear Mad Dog – This “stranger” is a 3-ruble-bot as we call them. One of the results of 25 years of Western naive openness to post-USSR Russians is the appearance of large number of English speakers-writers among them. However their brains are mostly the same, saturated with jealousy and hatred to the West. Mostly they are paid by FSB for every post although they write this stuff out of sincere belief. The best is to either ignore them or, even better, to ban them. Can you imagine any dialogue with a clerk of Hitler’s propaganda ministry? Or war-time German “journalist”? Not really. But as for others, he is pretty right on. That were the ancestors of your Ukrainian nationalists who served in H1tler’s death battalions killing Jews; who licked H1tler’s arss in their press issued by OUN, which is glorified now in Ukraine together with their leader Bandera. Then you are asking whom Russia defended Crimeans and Donbassers from? Exactly from those like above. You are lying in all other points too: yes, I’m Russian; no, I’m not paid for commenting, neither related to any other people; no, Russians don’t hate ‘the West’, moreover they consider themselves as a part of western civilization; no, ‘the West’ is not the same as the geopolitical ambitions of the US. It’s better to ignore such comments full of lie and hatred to Russians as yours, of course. Hitler’s Death Battalions? Weren’t they kind of like those Enforce the Revolution NKVD Battalions who made sure Ukrainians and Chechans had nothing left to eat and kept the Ukrainians from leaving while shipping the Chechans off to some god forsaken desert? Stalin (and even Lenin) was on a rampage long before Hitler pooped his pants in jail. On on hand NKVD who expropriated the private property and took grain to feed the rest of the country and for export to support industrialization. The same Ukrainians served in NKVD, it has absolutely nothing to do with Russians and Russian/Ukrainian relationships. On the other hand nationalistic Ukrainian battalions mostly from western Galitchina, serving in SS not for the battles, but rather for dirty job, police functions at the occupied territories, looking after prisoners in the concentration camps, gathering Jews for execution and shooting. That was related mostly to the western Ukrainians rather than eastern. Look yourselves if they are the same? Holodomor is a lie, a myth, invented recently in Ukraine intended to turn Ukrainians away against Russia. Even though both our countries were coming through that difficult times together. From the Kievean Rus times we are together regardless of what that nationalists say. Why do you emphasize NKVD pursued Ukrainians, Chechens? That is a rethoric of nationalists. Russians themselves suffered no less as well as other nationalities. There were almost no ethnical Russians in the head of politbureau – the Bolshevik government starting from Stalin himself. Blame Georgians in the terror of 30s maybe. Now such rhetoric is used solely to break up people by nationality. According to Solzhenitsyn the mistake of Ukrainian nationalists is their claim for territories never ever being Ukrainian. The eastern Ukraine and the south to Odessa as well as Crimea were taken from Turks/Ottomans. It was Lenin whose statues they are fighting with now, who actually created Ukraine by attaching the Russians provinces from the south and east. But even Bolsheviks didn’t guess to give away Crimea. Until Kruschev gave a present to own loved Ukrainian republic. Those areas mostly speak Russian and don’t share the nationalistic ideas of the western Ukraine. Btw the Hungarian minority at the western areas is also complaining now a lot of the Ukrainian authorities. The nationalistic course will torn Ukraine apart. In anyway Ukrainian should not have allowed the rising of such nationalists. US should not have tried to tear Ukraine from Russia to avoid “sovetization” as your failed witch formulated. Wow, you are getting a bit twisted in your old age. Like this: Holodomor is a lie, a myth, invented recently in Ukraine…..???? Gee, wonder why I knew about this many many years ago, even reading about it in Solzhenitzen novels in the ’60’s. The problem with Russia is so many folks don’t want to admit that Stalin times were evil and that he wantonly killed millions. Lenin was not much better, readily allowing peasants to starve in 1922, rejecting food imports from the US, shipping folks off to Gulags, etc. Instead of getting all twisted up about this and blaming it all on propaganda (which it isn’t since there were reports on most of these tragedies at the time they happened) (and despite the fact that the horror in the Ukraine is more well known than the similar policies decimating the population of Chechnya), you would be better employed admitting them and trying your damnedest to not let them happen again. Yet, you still sit idly by and blame others for the horrors visited on East Alleppo by both Russian and Syrian Aircraft, dismissing the civilian population there as Jihadists! Finally, your excuse for the situation in Ukraine being a result of HRC saying something (that was really spot on, BTW as that is exactly what Putin has wet dreams about), is funny in the extreme. You have consistently failed to give credit to people who are fed up with cruel corruption and arrogant thugs as leaders in both the Ukraine and Syria. Instead you just label them as Jihadists or tools of Hillary Clinton, but they are more than likely just common folk with hopes and desires similar to yours. (Oh yeah, Bolsheviks did not give away the Crimea, but they made sure Chechnya and Ingushetia were made part of the USSR. Oh yeah, then there was the attempt to take Poland, etc.). Well, no problem cause the Soviet Union….oh wait…Russia is being flooded with immigrants from some of those areas that were ruined by Soviet rule and to help with the falling male longevity numbers. Maybe this is a result of something Hillary said? Don’t you want to fresh your mind and remember what exactly Solzhenitsyn was saying about Holodomor? Briefly he said the great famine from Ural through the eastern Russia, Volga river up to Ukraine, was NOT an act genocide. That the very word “Holodomor”, which is the interpretation of the famine as intentionally artificially targeted genocide against only Ukraines, appeared decades later “firstly hiddenly, in the frowzy chauvinistic brains, hostile against ‘Moskals'” and then spread up to Ukrainian government, and from them to “the parliaments of all the world”. He was very critical to the politics of Ukrainian nationalists to break up with Russia. You seem to distort what Solzhenitsyn though. Where did you read on Holodomor? I know about the terror of Stalin times and of course I admit it. I’m just against the perverted reinterpretation of that spread in Ukraine that Russians pursued Ukrainians, that Ukraine suffer from Russia. Holodomor is the brightest example. That was from Bolsheviks and that harsh times, not from Russia! The same was going in Russia in the first turn. Bolsheviks had lost territories compared to the Russian empire, they tried to keep it and repartitioned later creating the modern Ukraine borders. As for Poland, that was complicated, see Pilsudskiy, Curzon line, etc. Clinton not only characterized the attempts to unite by the trade/customs union as “sovetization”, but she also leaked that the States are working to prevent it. I’m sure they did work on it! That became obvious when they helped and in fact made it possible to overthrow of the democratically elected president. Why the heck they interfere w/o understanding what they are doing. You know the history of US-USSR well, correct me if I’m wrong. Yes, American charity non-government organizations helped USSR with food during the famine in 1921-23. Thank them a lot. Right, later Lenin denied US help. What would you say about the Gold Embargo? In the beginning of 30s USSR announced the industrialization to redevelop the country, which nowadays would be called ‘diversification of economy and getting rid of resource export’. That idea was met adversity by US, Britain and what would be called now the West. In 30-31 US imposed embargo on accepting gold from USSR for trading. Other ‘western’ countries joined and later it turned in the embargo on all USSR goods, oil, lumber, etc, except… grain. Which was considered as an attempt to suppress the development of USSR, nowadays would be called ‘fiscal/sectorial sanctions’. Stalin still insisted on industrialization and the only export from USSR became grain. That coincided with the great draught of 31-32,and multiplied by the cruel and ineffective methods to expropriate private property and push everybody to kolhozes, caused the great famine, which later was reinterpreted by Ukraine as genocide by ethnicity only against Ukrainians. Just after that US and the West released the trading embargo. Unfortunately our countries have been so long at the enmity with each other. Regardless of the short situational alliance to defeat na3ism in ww2 and Russian empire’s help for US to free from Britain’s dominance in the early ages. So that current tensions fit into this historical picture very well, even though there is no any communism in Russia and no any Karl Marx’s ‘wild capitalists’ in US. That’s why I’m skeptical about improving the relationships and stop the Cold War and economical sanctions any time soon even with Trump. Clinton definetily would be much worse, that is the only reason Russia welcomes Trump, not ‘attempts to destroy US democracy and bring chaos’ and other BS. I wish we were friends with Ukraine and allies with US. We should stop to separate people. Please tell how that western embargo on USSR in 30s was justified from the US point of view? I’m no that old as you think. Likely younger than you. Christian, thank you for these interesting documentations! Regarding your article “The Remarkable Case of an Iraqi Car Bomb” and the distorted CCTV colors: The technical reason is the NTSC differential phase distortion. It is aggravated by bad cabling from cheap analog CCTV cameras. To stranger, as an European citizen i do believe that we need the support of the NAVO to protect the borders of the Ukrain towards Russia. The Rus and Slavish culture is different from the Russian culture like the Bolshevik’s who respect the Slavish culture differently. The Euraziatic continent includes Russia and Europe is complete out of history with the Ukrain and Turkey. Within the Balkan region Central Europe should not interfere in peace / family program’s due to the present post war family stituations. In both cases NAVO is the best neutral option for the safety of Europe. my other comment is on moderation but just to add Ukrainians are not Europeans, they are not our problem. Slavic culture is different from Russian culture? That is something new. Why? NAT0 – for safety from whom? From Russia? Has Russia ever threatened Europe? Could you give any citation how Russia threatened Baltics or Poland or anybody else? Compare to how many threats are pouring to Russia instead. The presence of NAT0 all over Russian borders may provoke an incident which will escalate. From the Russian side that looks like sabel rattling. Russia also is concerned on the anti missiles sites which would break the nuclear parity. Ukraine is different. For Russia Ukraine is very close country it is afraid to loose, deeply industrially integrated, hosting the legendary Russian black see (no longer). Inside Ukraine itself there are strong division on pro-Russian and anti Russian sides. Half of Ukrainians speaks Russian language everyday. Ukraine is not like any other country in Europe. Unfortunately Europe doesn’t want to accept Ukraine. To a great extent people were deceived when faced the choice either Europe or Russia. Even the cabal Euro Association is under question now. No any joining is supposed in any foreseeable future. At the same time they broke up with Russia, not without a help. I don’t justify Russia. Just want to note that Russia got mad after the overthrowing of legitimate president when all agreements and negotiations were broken by the coup where US played the crucial role. That the euro association and the coup ruined Russian hopes to create a trade union with all major post soviet countries which also would be more beneficial economically for Ukraine than the current discriminating euro association. Right now Russia just insist on the implementation of Minsk agreements which are supposed to give an autonomy to the rebellion region, which sympasizes and supports Russia. The signature of Merkel and Holand are also under the agreement. US claimed that there is no any other way but Minsk. But Ukraine is not going to implement because they would loose full political control over Donbas. Nevetherless Russia is blamed of the delay of Minsk. That’s why participation of NAT0 in the conflict at Donbas is not even considered. The Minsk is the only supposed solution. I mean Europe is Britain, France, Germany, Italy and others in western Europe. It is not f**cked up places like Ukraine 500 miles away. It is not the Baltic States. It is not Romania. It is not Turkey. Since when have any of these places been anything to do with Western Europe? There is a sad joke on Brexit. That after Britain, France would leave EU, then Germany and Spain, then Scandinavia and the rest of the west. But Ukraine will join, then Turkey, Georgia and Belarus. So finally Europe will have crawled to the East. So long awaiting by the door countries Turkey and Ukraine must be happy. Arya, you need a lesson in geography or the English language. Europe. as a continent, runs from the Atlantic and Artic Oceans to the Urals, Caucasus, Bosporous and the Med. The other side of that is generally termed Asia. So, yes, Ukraine, the place fucked up by decades of Russian interference is part of Europe. No wonder your posts have little validity if you can’t even get that right. If we had a comment hall of fame, I’d put this in there.